Earlier this year, the National Centre for Research Methods released a research paper to waves of interest from academics and researchers alike on Twitter. Kaisa Puustinen and Rosalind Edwards watched the number of downloads rise rapidly as the paper was passed around through the social media channel. Students, early career researchers and established academics may all ponder about how many interviews will be enough when designing their research projects. Sarah Elsie Baker from Middlesex University and Rosalind Edwards from NCRM decided to tackle this subject and produced a paper ‘How many qualitative interviews is enough?’ as part of the NCRM Methods Review series. We hoped that the paper would be popular, but were surprised to observe just how well it took off on Twitter. The paper was uploaded online late afternoon on Monday 26th March and was first tweeted to our followers the following day. The paper caught the interest of NCRM Twitter followers and within 24h it was retweeted 10 times to over 5000 followers and shared 135 times using social sharing tools (email, microblogging, social bookmarking, social networking) available on NCRM website. This resulted in 861 downloads within 24 hours of the first tweet about our paper. This was clearly a Twitter effect, as the paper was not publicised anywhere else at that time. 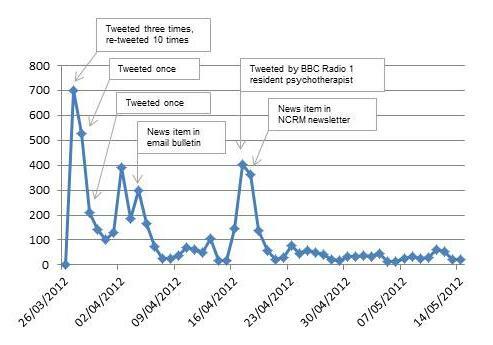 This graph illustrates the download trend and the publicity actions for the paper ‘How many qualitative interviews is enough?’ during 26th March and 14th May 2012. Since the release of the paper, it has been downloaded 3936 times and shared 518 times using social sharing tools, making this paper one of the NCRM’s most popular papers ever. The on-going debate about changing forms of academic dissemination focuses a lot on the pros and cons of engaging audiences in social media, making research open access and whether hard-copy publication is a thing of the past. The question of resources, time and budgets may force many academics to evaluate their dissemination methods and ask themselves whether it is worth spending £1000 out of the research budget on having a print poster or a brochure designed, printed and posted, or whether they should simply spend a single hour each week engaging (but not spamming) on social media platforms and reaching far wider audiences than any print material ever could. In addition to being mindful about good use of resources, personal online reputation and being in control of it should be of interest to every academic. Publishing research online has made sharing easy, which is in everyone’s interest (perhaps apart from conventional commercial publishers). Universities and research centres can encourage the sharing and uptake of their research by integrating sharing tools, and individual researchers can promote their own and their colleagues’ research by blogging and tweeting about it. With the impact agenda in everyone’s mind but with no consensus on how best to demonstrate the impact of research, at NCRM we have set Key Performance Indicators for the website, in addition to monitoring the performance of some of the print materials via print-specific website addresses and QR codes. By making sure that not only do we publicise NCRM research, but also are able to track the effectiveness of those publicity activities, we trust that we will be in a good position to demonstrate the short and long-term impacts of our research. Of course, I agree that Twitter is a great way of drawing attention to interesting academic work — your own, and that of others. The only bum note here is the idea that you should “should simply spend a single hour each week” sending out your message on Twitter or other networks. That’s not how to do it, is it. Twitter is about an ongoing conversation; one which can’t be too self-serving. So it requires more involvement than that — but is worth it. @ David Gauntlett: The suggestion about using an hour each week was meant as 60mins over a week i.e. not 10-11am each Wednesday. 60mins a week in 5-10min chunks is a good start, but most importantly you have to understand the platforms you use and produce appropriate content for it. What works in Twitter does not necessarily work in Academia.edu .